Baal (pronounced "bale") could be alternatively titled Obliterator Meets Barbarian. 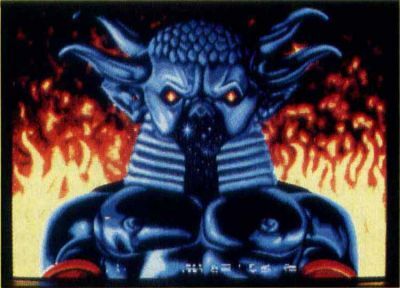 There are so many similarities between Baal and these two previous Psygnosis releases that a comparison becomes inevitable. Owners of these previous products will want to know what advantage there might be to adding Baal to their libraries. What does Baal have that Obliterator and Barbarian don't have? In Baal, the player takes the role of Time Warrior, sent into the underground world of the evil Baal and his grotesque beasties. The Time Warrior is reminiscent of the Obliterator character, and the monsters he faces resemble those from Barbarian. 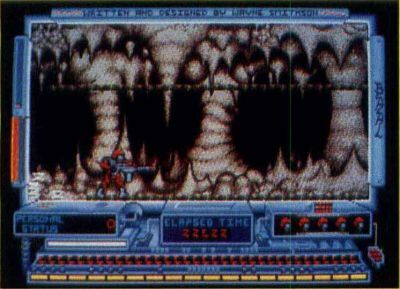 The player must enter Baal's domain and search for and abscond with pieces of a doomsday weapon that Baal intends to unleash upon unsuspecting humanity. Along the way, all sorts of evil creatures attempt to put an end to the Time Warrior's quest. The graphics are nicely detailed. Several shades of the same color paint a haunting underworld empire. Like Donkey Kong, platforms and ladders are used to move around inside this domain. The background scrolls smoothly, but this is probably due to the fact that there are few animated objects for the program to keep track of. The Time Warrior is clearly depicted as well as accurately and amusingly animated. Because the character's laser blaster is large and heavy, it must be carried in both arms. Consequently, he bobs up and down with each step, as if the burden were weighing him down. Each creature is interesting and has its own method of thwarting the Time Warrior's progress: A flying frog, for example, drops green globules that adversely affect the personal energy status of the Time Warrior. Other adversaries are more difficult to outwit because they present more of a barrier. Since the Time Warrior cannot aim his blaster (he can only shoot horizontally), the shorter creatures can be hit only from a "down" ladder. The program does support eight-way scrolling, but at first glance this graphic function is not readily apparent. Actually, while the Time Warrior is on foot, he can only move left/right or up/down. The diagonal movements are only possible when he has found a rocket suit (something that is not even hinted at in the documentation). Stopping inside an area bounded by red lines above and below will activate this area's Dr. Who-like gimmickry. A sign slides down that says, "Phone out of order," and when it goes up again, the Time Warrior is ready to rocket off in any of eight directions. If he doesn't find the correct booth in which to park his rocket suit, the energy will expend itself in an explosion, and one life will be lost. The trigger button is required to differentiate a somersault from normal movement. Otherwise, it is used to fire the laser blaster in whichever direction the Time Warrior is currently facing. The player has a limited amount of energy for firing, but this limitation can be overcome by refueling at the few service stations found along the way. While the laser blaster is being refueled, the Time Warrior's personal energy field is also being recharged. The player will discover, scattered throughout Baal's domain, icons representing rocket fuel. Collecting one of these will qualify the player to use the rocket suit. Fuel icons seem to be more plentiful than laser refueling stations, but they are not always in the right place at the right time. Several keyboard functions allow further configurations of the Time Warrior. After collecting ammunition packs, pressing the corresponding number key will activate an enhanced level of firepower. The blaster doesn't change; it just becomes more and more deadly. Other key codes allow the area coordinate display to be toggled on and off and to pause or restart the game. In a sea of other software firms that believe they cannot afford to add goodies to their "generic" titles, it's nice to find that Psygnosis has maintained certain amenities that computer gamers have become accustomed to. For example, the top 50 scores can be saved to disk. Also, there is a rudimentary game-save function. Although it can be activated only at a refueling station, it comes in handy; a real lifesaver! Finally, Baal features three unique domains, 250 screens, many interesting sound effects, an 11-minute musical introduction (you can skip it if you desire to jump right into the fray), 400 traps and more than 100 monsters! In the final analysis, Baal doesn't really break enough new ground to be heartily recommended to owners of Obliterator or Barbarian. Other potential buyers will appreciate Baal's price and the game's ability to transform its owner into a Baal addict!